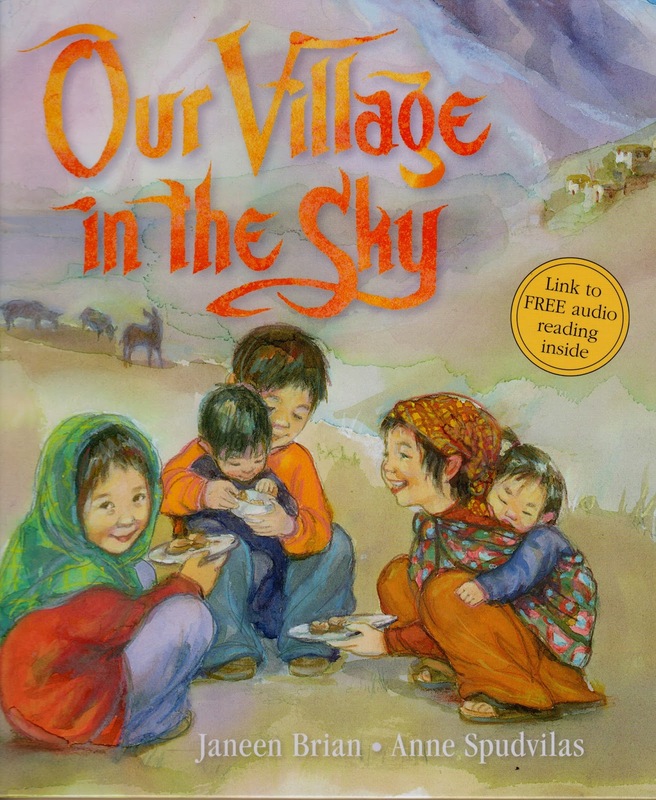 'Our Village in the Sky', illustrated by Anne Spudvilas, published by Allen and Unwin. So I posed some questions for Janeen after reading her book. What ground breaking work- a picture book in poems exploring the everyday world of children in another country. Were the poems based on real life observation? They certainly were. I lived with a family for a month in a remote village situated in the region of Spiti. It lies in a valley within the rugged, Indian Himalayan mountains with its scree slopes and astonishingly deep gorges and adjoins Tibet. With language being a barrier, I spent a lot of time observing the local children and their lives. How important is it to give action and details in your poetry? When I first began writing poetry, I was like every other ‘newbie’ where I thought a generalisation or a bland, all-encompassing comment was sufficient or even good. After all, I was just learning to express myself, and attempting to feel comfortable writing poetry, which had never really been a big part of my school or home life. It took years before I discovered that poems only resonate when readers or listeners can picture an image or relate to a mood or emotion. You can’t picture or relate to a generalisation. And a poem needs to move, either with active events, or words that suggest movement and energy. Why did you choose this location in the world to write about? It was part of a writing trip I was on, travelling with an artist friend. There’s an audio link to the book inside. Is this innovative or intrinsically tied with the nature of poetry? What a great question! 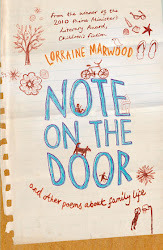 Firstly, it was an innovative suggestion from the wonderful publisher at Allen & Unwin, and I was thrilled about it. By clicking onto the website or accessing the QR code, anyone can listen to the poems being read by two child narrators, a boy and a girl. It’s a great way for children to read along with the narration. Or for children who simply want to look at the pictures or the words, and listen to the poems. I think it could also help reluctant readers, because they can both hear and see the words at the same time. The second great reason is, of course, that poetry is meant to be read aloud. It’s word music. It’s wonderful to hear words and language coming together in poetry form, in a concentrated, pared-down style that often shortcuts to the emotions. Often a feeling, image, memory or phrase stays with you long after the book is closed and the words are hushed. Janeen, you have always written poetry, so how did the idea for this picture book of specific poems come about? My poetry writing varies from free verse to humorous verse, often done in rhyme. I’ve written, and had hundreds of individual poems in both genres published in anthologies, children’s magazines or they’ve been the basis of picture books. I spent a lot of time in the village, observing, photographing and jotting down notes. At the time I had no firm idea what I would do with such material, but later I decided I wanted to compile a set of poems depicting the play and the responsibilities of village children living in a remote village, which was so different to our Western style of life. Several publishers were keen, but it was only when the illustrator, Anne Spudvilas took some sketches and my poems to Allen & Unwin, that it was accepted. It was a long wait, but well worth it. What do you hope will be the outcome in terms of readership and ideas/pictures conveyed in your book? The poems are simple, easy to read and can be read independently of the wonderful, evocative illustrations, but I believe, in this instance, they help support each other. They are deliberately understated but they are honest observations, with my own imagination thrown in. I hope the readers or listeners will enjoy the language and anecdotal imagery that hopefully highlights the lives of children of another culture. Perhaps they might like to try writing poems based on observations themselves. Thanks Lorraine, for these interesting questions! And thanks Janeen for providing that inside information about writing a book that we eagerly seek. If you'd like to purchase a copy for yourself here's the link. And I wish 'Our Village in the Sky' great success. Labels: Janeen Brian, our village in the sky, picture books, poetry, story behind the writing. residency to write for a month in Brisbane, 2015. The unit sounds wonderful and information can be found here. 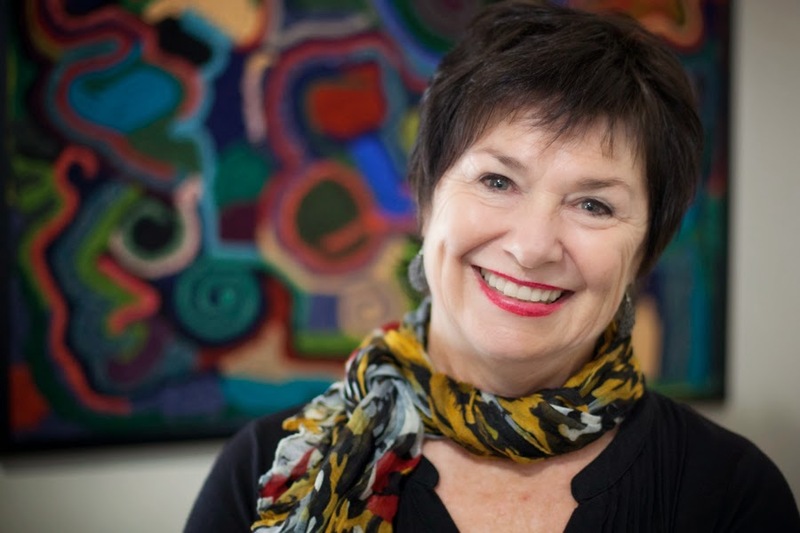 I have been fortunate to have obtained residencies before in Adelaide and loved the supportive writing friends and those who donate time to look after the 'fellows'. 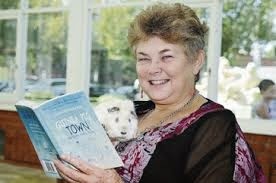 In fact my verse novel 'Star Jumps' was written in Adelaide and went on to win the children's section of the Prime Minister's award in 2010. I just appreciate so much the focused time away from commitments at home, distractions and with a writing program of my own to follow. This time it's to pull apart and re-write a novel that's dear to my heart- no poetry, or verse novel, but a 'normal' novel. How fortunate we are to have such an organisation in Australia supporting our children's authors. I will take workshops with the state library of Queensland while I'm there. I've had my first taste of taking workshops in Queensland and met some wonderful audiences and teachers. Here is a lovely face from Toowoomba and the wonderful library. 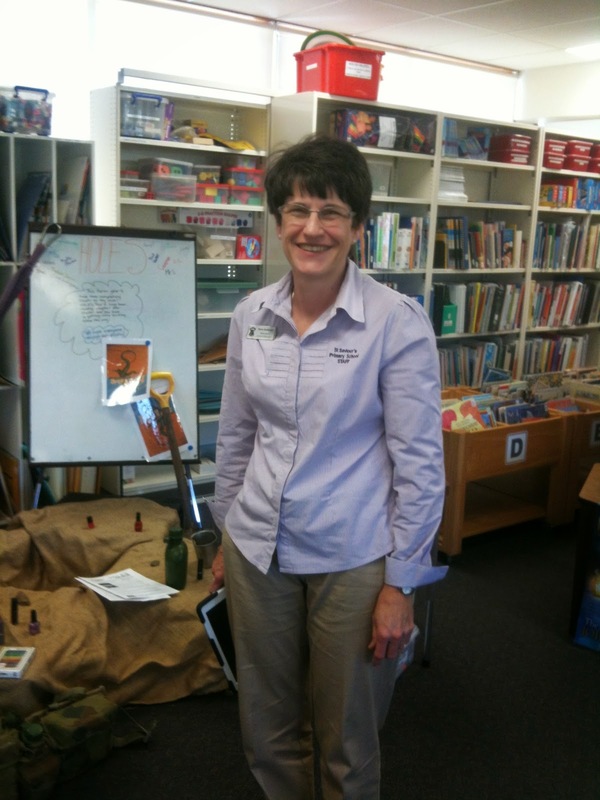 I also took two weeks of poetry workshops at Sydney Boys' grammar and had the delightful experience of my verse novel 'Ratwhiskers and Me' set on the goldfields chosen as a term read for year 5 boys. Li, the lovely librarian stacking the books ready for distribution to the boys. Wonder what they thought of the novel? In between travels and a massive workload of writing strategies for new workshops, I lost my father. But was so glad I took a plane back to be with my mother and family at dad's bedside. Here is a poem I wrote a few years ago, remembering the hard work my father did on our little poultry farm. It was read out by one of my son's at Dad's funeral. where ever our father worked. of hot, to warm, to cool. back the way we came.